WHERE to start? For the two fighting Mercedes-Benz drivers, Nico Rosberg and Lewis Hamilton, the Spanish Grand Prix was over after 30 seconds, paving the way for Red Bull and Ferrari to fight over the victory at Barcelona’s Catalunya circuit. In an intriguing contest of two different strategies – two-stop and three-stop - Max Verstappen, emerged from his debut drive with Red Bull as Formula One’s youngest winner, sending his army of supporters in paroxysms of joy. He is the first driver from the Netherlands to win an F1 race. The recent Russian Grand Prix call by the Red Bull hierarchy for Verstappen, formerly at Toro Rosso, to swap seats with Daniil Kvyat now looks like a masterstroke after the Dutchman, aged 18 years and 227 days, turned in a mature, faultless drive to become the first driver from outside Mercedes-Benz to win a GP this season. For the last 32 laps, Verstappen beautifully managed a tyre-conserving two-stop play, used his right clog sensibly to control the race from the front and keep at bay the experienced Kimi Raikkonen, winning by 0.6sec. Third, a further 4.9sec back, was Sebastian Vettel, having survived a torrid battle with a hard-pressing Daniel Ricciardo in the other Red Bull. Vettel and Ricciardo were both running three-stop strategies, and the extra time in the pits hurt them badly. Versappen’s stunning drive into F1 history will be long remembered (perhaps until a 17-year-old comes along and supplants him as the youngest-ever winner) but we’ll also be talking about the crazy/awkward demo derby involving Hamilton and Rosberg (as depicted in the video, top). It happened this way. 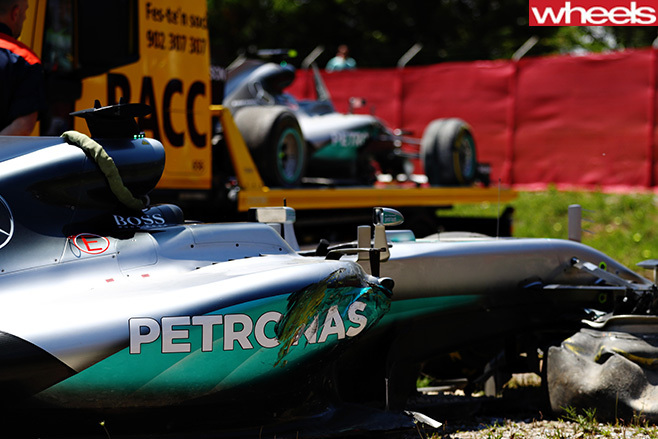 Off the line, Rosberg bested pole man Hamilton and drove around the outside of three-time champion in turn one. But Hamilton, trailing closely, made a better fist of exiting turn three, and aggressively moved to the right to fire down the inside of the fast-approaching right hander. Events were unfolding in a blur. Rosberg – in the wrong engine mode as it turned out – quickly moved to block, but Hamilton already had his front wing up to the German’s rear wheel. Hamilton had two right-side wheels on the grass, lost control and slid at high speed into Rosberg’s car, carting both into the gravel outside turn four. Stewards later dismissed the clash as a racing incident. 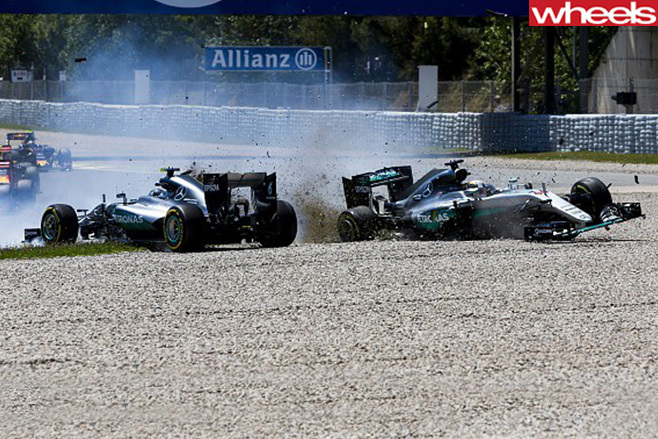 Either way, it was an ignominious end to the GP for both Silver Arrows. The race was then neutralised by the safety car with Ricciardo leading his new teammate Verstappen, followed by Spaniard Carlos Sainz Jr, who had started eighth in his Toro Rosso, and the Ferraris of Vettel and Raikkonen. Vettel and Raikkonen dispatched Sainz when racing resumed, creating the scenario the fans wanted – a tight battle between Red Bull and Ferrari. While the Mercedes heavies met with their drivers behind closed doors, Red Bull and Ferrari played cat and mouse with similar strategies at their first stops for medium compound rubber. Then both split their drivers on to different tactics; Ricciardo and Vettel on a three-stop plan, while Verstappen and Raikkonen remained out until laps 34 and 35 respectively, committing to two-stop strategies with a long stint on mediums to the finish. 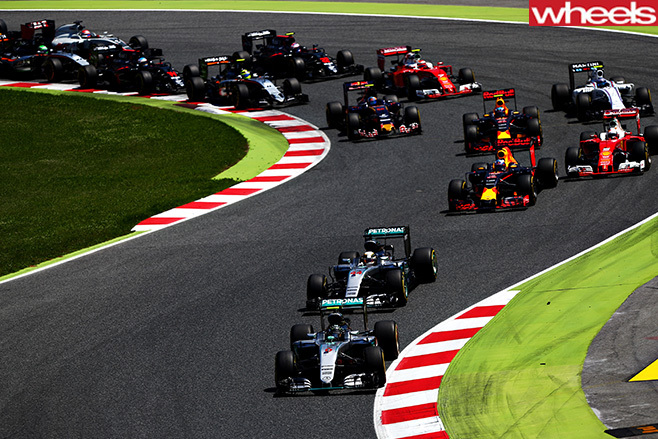 Despite unrelenting pressure from Raikkonen, Verstappen kept his cool to score an extraordinary win. Verstappen insisted he wasn’t nervous during the race, but tried hard to drive the best he could. “We focused a lot on keeping the tyres alive because at my last stop I still had to do 32 laps until the end, but it worked out well,” he said. “With five laps to the end I saw Kimi was dropping off a bit, he tried a few times and of course it kills your tyres and from there I just like ‘okay, focus on the tyres now and bring it home’. Ricciardo, on slightly fresher tyres than the third-running Vettel, was never about to die wondering. With the laps running down, he made one spectacular lunge on Vettel into turn one, but didn’t quite make it stick. Vettel, who showed great awareness to evade the menacing Red Bull, took to the radio to express his displeasure. Vettel was calmer later. "It was once hairy in the first corner," he said. "In that instant I was on fire and complaining because if I didn't play according to his move, there would be a crash. Then again, it's racing. The one chance he had was when I had a bad exit and he has to go for it. "I have raced him many times and it's good fun." The Aussie remained fixated on a podium finish until, on the last lap but one, his right-rear blew, sending him to the pits. But with a big margin back to Valtteri Bottas’s Williams in fifth, he managed to hold on to fourth. “Mixed emotions today, for sure,” said Daniel Ricciardo. “Some of it was just bad luck today, I was leading and then went on a three-stop strategy, which meant I had to try and pass three cars on track, which isn’t easy. Seb had already jumped us on the pit stop, which resulted in more overtakes to get back to the front. Local boy Sainz was fifth, four places ahead of new teammate Kvyat. All this at a circuit that rarely produces much in the way of overtaking, where the front row traditionally produces the winner, and where the racing sends us to sleep. Rosberg, with 100 points, still sits atop the drivers’ standings but Raikkonen is now second on 61, with Hamilton 57. Vettel and Ricciardo have 48 points apiece. Third-gen racer converts solid qualifying to 16th on debut. 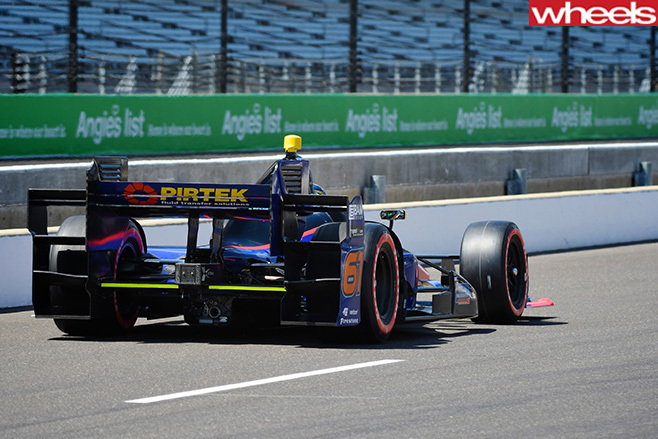 While France’s Simon Pagenaud raced to his third consecutive race win for Team Penske in the 2016 IndyCar Series - Angie’s List Grand Prix of Indianapolis – Australian eyes were on Matty Brabham, making his IndyCar debut. The third-generation racer certainly wasn’t overwhelmed by the intimidating history of the storied Brickyard. He qualified 16th after limited running – later re-slotted to 14th after two rivals lost their qualifying times. And come the 82-lap race, Brabham did everything right, kept to the script demanding he stay out of trouble and learn. That he did, finishing behind regular racer Marco Andretti in 16th. 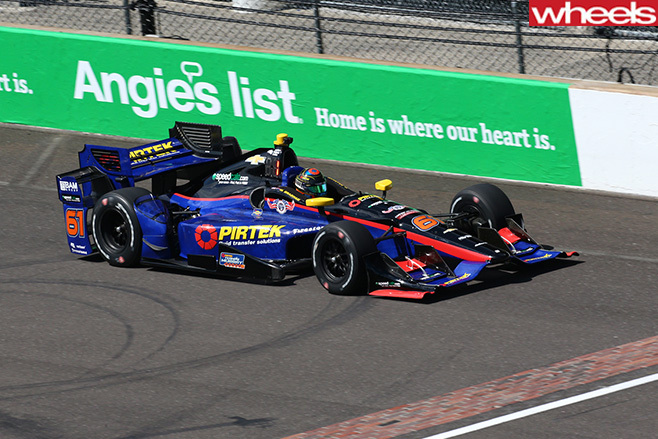 The Angie’s List Grand Prix of Indianapolis - held on the 3.9km clockwise Indianapolis Road Course with nine right handers and five left hookers - was Brabham’s IndyCar race initiation and shakedown for the biggie, the 100th Indianapolis 500, two weekends away. 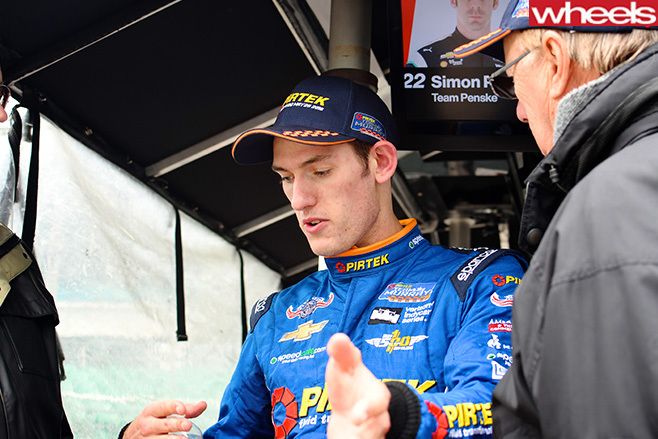 The Queenslander, grandson of Sir Jack and offspring of Geoff, has committed to two IndyCar races for the Pirtek Team Murray outfit created by enthusiastic website businessman and rev head, Australian Brett Murray. Murray was impressed that Brabham survived the inevitable first corner incident and once the race went green got to relax and settle into a rhythm. The feature of his second stint was an encounter with fellow Queenslander, Will Power. Both on the red tyres, the rookie was able to pass the former champion. This was a battle that continued throughout the race. Brabham passed every challenge presented to him with flying colours. This was the longest race in his career, the first race for him in IndyCar and the first race with pit stops. “The start was crazy - there was so much stuff that was flying around, the buffeting on my head was unbelievable,” Brabham recounted. “The whole experience was definitely different, I had never done anything like the restarts, push to pass or pit strategies before, but it all went pretty smoothly! 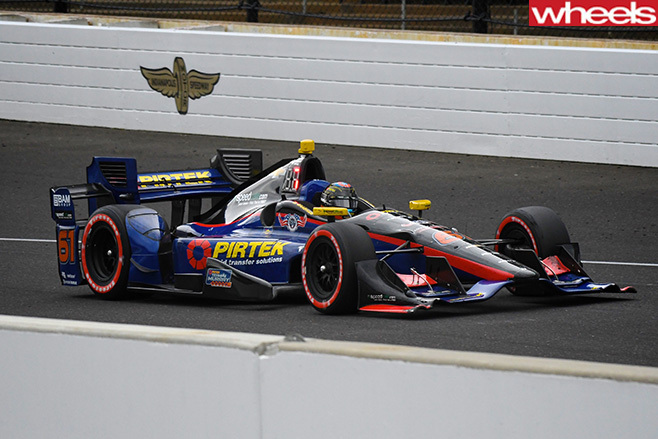 “It was weird and surprising to be racing and dicing with both Marco Andretti and Will Power there. I watched both of those guys as a kid. I thought it was all a bit surreal! “I now know how the guys race each other and the buffeting when you get close to cars and the racing in a group, which was all new. It really gives me a good platform going into rookie orientation on Monday and the 100th Indianapolis 500 preparations. Fifteen places up the road, Pagenaud romped away from the field. “The car was fantastic once again," Pagenaud said. "The balance was perfect all race. When we were in the lead, we were cruising, doing what we could to save the tyres. But the car was just fantastic to drive. Sharing the podium with Pagenaud, who is enjoying a stunning purple patch, was Brazil’s Helio Castroneves and Canada’s James Hinchcliffe. Pagenaud extended his lead in the point standings over Ganassi’s Scott Dixon, seventh at the weekend, and Penske teammate Castroneves. Will Power’s unhappy start to 2016 continued, with the Australian classified 19th. Twenty-three cars were running at the finish. Practice for the Indy 500 begins today, Monday May 16. But defending world champ Rea leaves Sepang with an increased points lead. 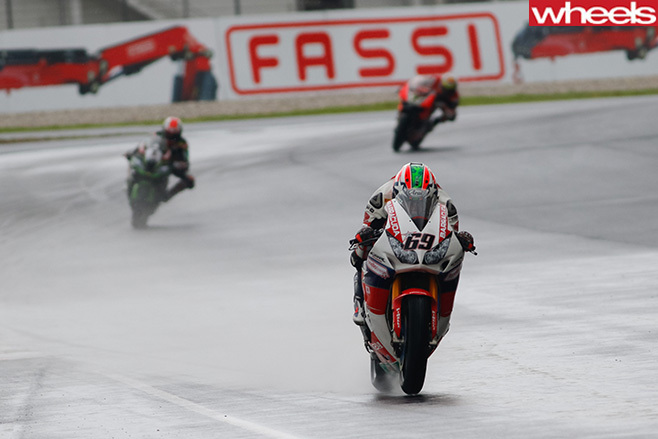 Kawasaki’s Tom Sykes rebounded to his winning ways on Saturday at a tyre-friendly Sepang, while on Sunday Nicky Hayden made the best of some wet-and-wild conditions to score his first win in the World Superbike Championship since switching from MotoGP this season. It was also the American’s first international race victory in close to a decade. He is riding for Honda. But defending champ Jonathan Rea had another solid weekend, taking second in the dry and a third in the wet to increase his lead in the 2016 title chase. 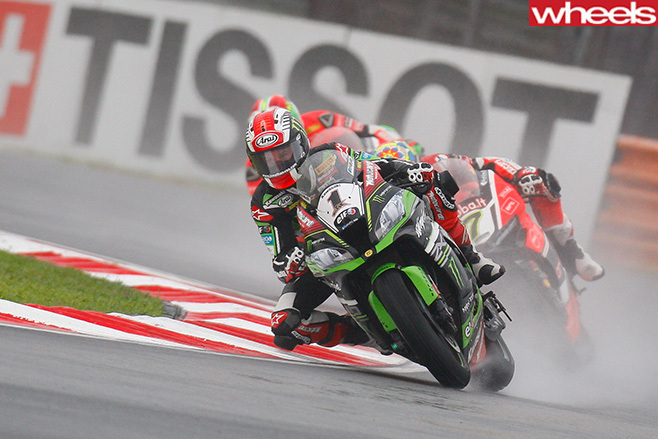 Kawasaki’s Rea remains the only rider on the grid to have been on the rostrum in every race. Australia’s Anthony West, riding as replacement for Sylvain Barrier at Pedercini Kawasaki, lived up to his reputation as a smart substitute of choice, taking ninth on debut on Saturday and then confirming his mastery of wet conditions, landing a great fifth on Sunday (ahead of some factory bikes).